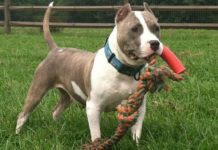 PitBull Training Questions or How do I Train My American Pit Bull Terrier? Following are some common training questions that I have received and their answers. 1: How old should my dog be before I start training her? With positive training, a dog can be started as early as 7 weeks of age. However, to teach formal obedience the dog should be older. 4-6 months of age is a good time to start formal obedience training using positive methods. One important note, in order for a dog to learn a new behavior they have to be old enough to be able to understand that behavior. Teaching a 7-week old puppy to heel would not be a good behavior to teach simply because it takes concentration that a puppy of that age doesn’t have yet. 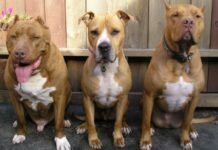 2: Are Pit Bulls harder to train than other dogs because of their dominant nature? 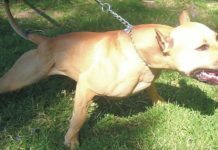 First and foremost as a breed Pit Bulls are not dominant by nature. They are, on a whole a submissive breed. Some individuals can be dominant by nature, but for the most part, they are not. To the first part of the question, no, they are not harder to train and do not need any special handling (other than proper technique) in order to train them. 3: My dog is stubborn and won’t listen to me. What can I do? First and foremost dogs are not stubborn. This is a myth. What we see as stubborn is what I call handler mistakes and dogs doing what they have been allowed to do. For example, if your dog doesn’t come to you until the 10th time you call them you might say they are stubborn. I would say, you have trained your dog that it’s the 10th time they should come and not the first time. So it has nothing to with being stubborn. It has everything to do with the fact you did not set the standards to one command, one reaction, one result. Come, a dog doesn’t come, you go get them. This results in ONE command, ONE reaction (dog coming to you) and one result (solid recall). 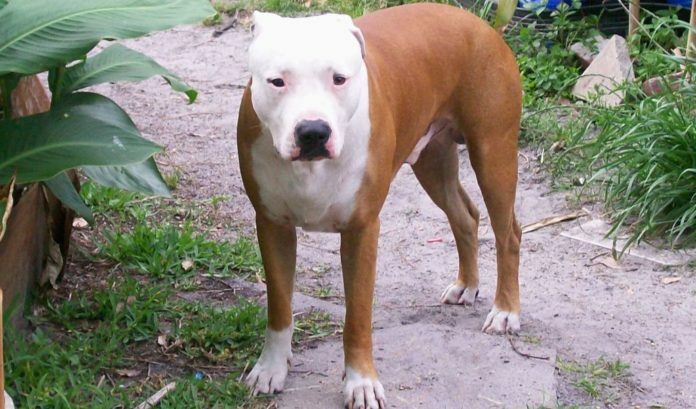 4: How do I house train my pitbull? Take them out a lot. Adjust their feeding schedule and wait 20-30 minutes depending on the age of the dog. Then take them outside and let them do their thing. Wait until they have used the bathroom before you bring them back in. If this takes some time, bring them back in, wait 2-5 minutes and then take them back out. The idea is to show the dog that going outside is a good thing. Do not hit, scold, rub their nose in it, simply say NO when you catch them, take them outside and be done with it. If you don’t catch them, clean up the mess and go on with your life. 5: How do I stop annoying behavior problems? Try taking your dog for longer walks (during the hot months use caution and take a lot of water) more often. Instead of 5 10 minute walks, try two 45-60 minute walks per day. This alone can curb and has been shown to stop behavior problems in their tracks. 6: How do I stop leash pulling? To stop leash pulling your dog can never be allowed to pull you. If this means you stop after 5 feet of walking and return home, then that’s what you have to do. You can use a prong collar but sometimes this doesn’t work because once the collar is removed the dog pulls again. The best method I know of is to change direction a lot. Start off by walking and when your dog is almost to the end of the leash, do a 180 turn and walk in the opposite direction. They will self-correct themselves. As you do this turn call them to you in a happy voice and speed up your pace until they catch up. Once your dog is almost at the end of the leash, turn to the left, turn to the right etc… Keep changing the direction up and your dog will eventually start looking at you because they have no idea where they are going. Repeat this a lot. If you only get 30 feet, that’s fine, take them out to the yard and play fetch or spring pole them for 20 minutes to get that exercise in. 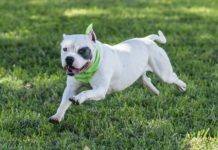 But in order to keep your dog sharp and reliable for their entire lives, you have to constantly reinforce their obedience and give them new behaviors to learn to keep their mind sharp and their body in peak shape. Training only stops when your dog or you stop. You don’t have to be a professional and you don’t have to spend hours on end training your dog either. All you need is 5-15 minutes a day, a few treats, patience, and proper technique. 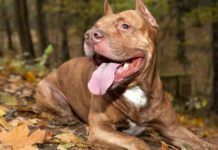 With these things, you can train your dog easily and over time they will learn many behaviors and be a better companion and you will be a better friend to them as well. 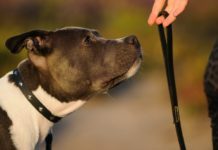 Almost 70% of the dog bites that occur in the United States occur from Intact, Male dogs, with no training that are kept on chains. 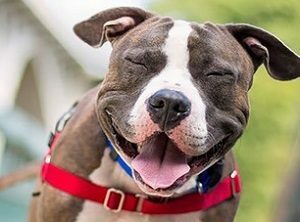 Training your pitbull is the most important thing you can do for them.